Game cinematics are not part of actual game play. Instead they are storytelling mini-movies that occur between game levels. 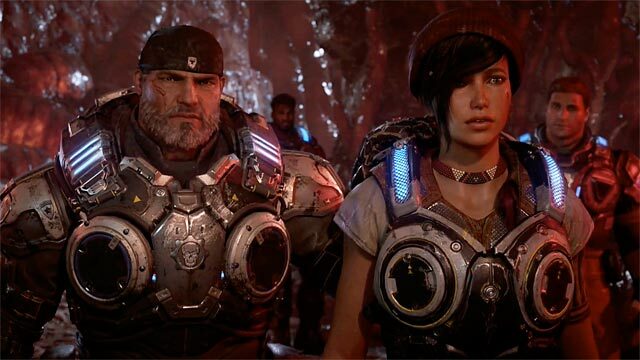 The actual game, Gears of War 4, was produced at Microsoft’s Coalition Studios in Washington but they farmed out much of the cinematic work to Digital Domain, which hired me. Microsoft's Cinematic Lead Brian Whitmire provided all the assets and guidance we needed for the project. The character rigs had all been beautifully modeled and rigged. There were five animators on our team, and we were able to choose the sequences we wished to animate. Immediately, I was attracted to the finale, a horribly tragic scene where the character Kait discovers that her mother is attached to a parasitic alien life form. The goal of the job was to merge the body motion capture, recorded dialogue, and facial animation into wholeness. Because the motion capture performers and voice actors were different people, all recorded separately, the body motions needed augmentation to be in sync with the dialog. Even the breathing motion was added. The hands, hair, equipment, and various dynamic motions all needed to be animated. Any form of bodily contact required extra consideration. That included integration with the environment such as conforming the feet to the irregular ground. For me, the most satisfying part of the process was working on the facial animation, which brings the characters to life with the intent being to animate the faces as realistically as possible. Our supervisor, Matthias Wittmann, was very particular about the facial movement, especially the eyes, the windows of the soul. In animation, there is always the danger that realistically animated human-like characters will give a creepy feeling, known as the uncanny valley, to the viewer. In this case, I thought that the characters were caricatured enough to avoid that “too close to human” appearance, and the setting and rendering gave an illustration look rather than an implied reality, so I was very pleased with the final outcome.